The Squares, Featuring Joe Satriani, Release "Give It Up"
Be the first to hear this previously unreleased tune from Satch's first, pre-fame band. Early demos of Satch's first, pre-fame band will be made available for the first time. Satch dishes on how to go about blending different styles to improve your improvisation. Satch demonstrates some interesting things you can do with stacked fourths. 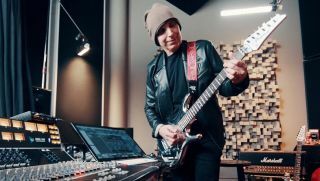 Satch dishes on how to approach crafting a melodic line for either a song’s theme or an improvised solo. "Being a kid from New York I found his entire approach kind of exotic." Joe Satriani on the influence of Jethro Tull's Martin Barre on his playing. Satch will be joined by Neal Schon, Rick Nielsen, Kiko Loureiro, Lari Basilio, Bumblefoot, Carlos Alomar and more for four days and nights of pure guitar pleasure in Palm Springs, CA this January. Dates will also feature Dweezil Zappa, Eric Johnson, Jonny Lang and more. Join these top-notch players for four days and nights of workshops, jams, meet-and-greets, nightly concert performances and much more at The G4 Experience V5.0. Limited-edition collection gathers documentary, unreleased music and more.